Foreshadowing is an interesting thing. I wrote last year in my annual Halloween post that it might be the last time I say goodbye to my father and that I was moving forward to create my own family. While I already knew that I’d upped and gotten married, I was not yet pregnant… and yet, here I am now. If you’d told me a year ago that I’d have gone through all that I have — I would have laughed uncomfortably in your face. At this writing — the late hours on October 30 — my brain is an exhausted mess, my heart is bursting with love for all that is my life. I put the little one to sleep a couple hours ago, and she makes me smile every.damn.day. No one told me that it would be like this, and yet they did: she literally pooped on me more than once today, and still I love her more than words. That photo up top? Hubba Hubby took it. 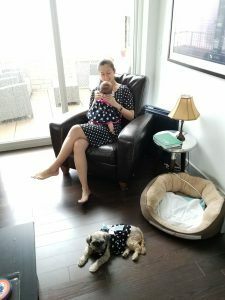 It’s a picture from the birthday party he threw for me — oh yes, I turned 37 last week — I managed to accidentally buy a dress that matched a dress the dog already owned, which led to my decision to find a dress for the baby to match both of us. I think I did an OK job with that! Earlier today, I was holding the baby up and looking at her, she was looking at me, and she gave me this giant smile. The smile I know she uses to mean “HI MOM! YOU’RE PRETTY AWESOME” but also “HEY I POOPED YOU SHOULD CHANGE ME MUHAHAHA” — and I melted. My heart melted instantly, and I almost cried from this strange overwhelming feeling. We did this, we made this, I glance over at my husband and we share that secret language, the knowledge that holy hell this is our child, our daughter, for whom we are responsible forever and who we will try to raise to the best of our abilities to be an outstanding contributing member of society. I have to set a good example for her. I still laugh at fart jokes. And farts. How can I be a good example for her?! But it’s Halloween, my dear readers. It’s the anniversary of the day my father left me, a 20 year old girl, to continue onwards into adulthood without his guidance. It’s Halloween, 17 years since he passed away. It’s Halloween, the day I normally descend into a weepy mess and sulk and ignore the world around me. My dear readers, it’s Halloween. It’s my daughter’s first Halloween, my husband’s favorite holiday. It’s not just about me anymore. Nothing I do is just for me anymore (even the things that are) — I do it for her, for my family. We have a family costume, the three humans are dressing alike. We will go out to the local street fair, and smile, and (maybe) collect candy. We will drink hot apple cider and we will laugh and look at costumes and take pictures and go to the haunted gazebo and eat cider donuts and hold hands and be happy. I will not sulk. I will likely hardly think of my father, but instead focus on if my daughter is warm enough in her costume or too warm. Is it slipping off her shoulders because I bought a slightly too big size, is it choking her? Is she uncomfortable? Is she hungry? Is she having a good time, even though she will never remember this and only know it happened because of all the pictures we took? Is she happy? I never thought parenthood would change me as much as it has. I wanted to stay who I was, but also happen to be a parent, but that’s not how life works. In a way, this is who I always was, but now I’m also this other person. I have a tiny little creature who depends on me for everything. On this night, I remind myself that I am still Yvo but also that I am no longer just Yvo. Dear Dad, I’ve only just begun to know how you must have felt when you first became a parent. How it felt to be responsible for the life of another living being, how hard you worked to set a good example, how the weight of the world rested on your shoulders… and I appreciate everything you were and did even more now than I could have imagined. *I may re-read this tomorrow morning and wonder what on earth I was even thinking… but for now, I’m going to bed. « Celebrate #NationalChocolateDay with Macy’s Culinary Council and Chef Johnny Iuzzini! Oh, Yvo! My heart grew three sizes when I saw this photo! So very thrilled for all of your happiness. Thanks for the midday tear jerk. Aww, but it’s a happy post! In my opinion, laughing at fart jokes makes you an even better parent.